Named after Queen Victoria and Prince Albert, The V&A museum covers 12.5 acres and is the world's largest museum of decorative arts and design, housing a permanent collection of over 4.5 million objects. The Established in 1852, the London museum spans a wide-range of art of all materials and media. Searching their online archives, I discovered many amazing and historic architectural replicas and models in their permanent collection. A model of the Tempietto of San Pietro in Montorio, Rome is carved from walnut and pearwood. A miniature replica of the memorial to Prince Albert, which stands in Kensington Gardens, London. 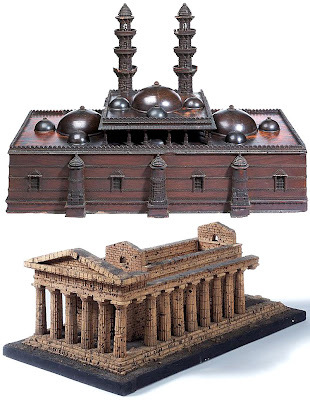 Carved wooden model of the Miyan Khan Chishti mosque in Ahmadabad. 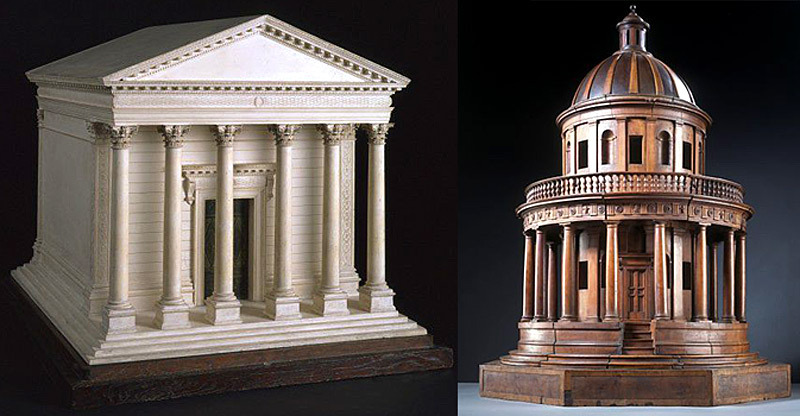 Plaster and wax model for the Wellington Monument in St Paul's Cathedral. This model of a tomb at Palmyra, was probably made by Jean Pierre Fouquet and François Fouquet in Paris in about 1820. This is an architectural model, made of cork, represents the Temple of Concord, in Agrigento, Sicily. This model appeared at the British Empire Exhibition in Wembley in 1924. This is an architectural model of the Temple of the Winds, Athens. It was made of plaster with hidden iron supports by Jean Pierre Fouquet. Miniature replica of Mahabodhi Temple at Bodhgaya, which is the holiest of Buddhist pilgrim sites. Carved sandalwood model of the prayer niche in an Ahmadabad mosque. Brass models of a Sumatran rice barns. Plaster model of the triumphal arch, known as the Arch of Constantine, in the grounds of the Coloseum, Piazzale del Colosseo in Rome. Marble Arch stands at the top of London's Park Lane, but originally located outside Buckingham Palace. A cast plaster replica is in the V&A’s collection.